Last week I saw this post at Forked! 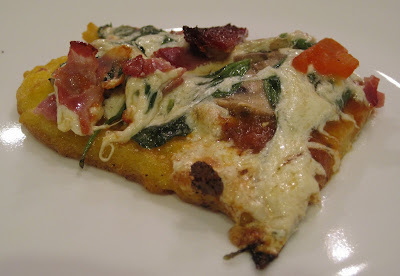 - Polenta Pizza. I thought it would be something new and maybe kind of healthy to try - lots of veggies. And polenta, something we've never made. 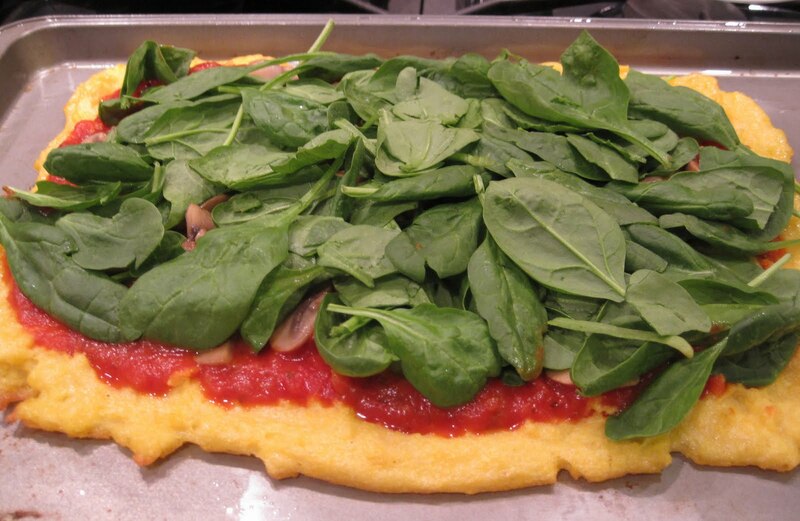 We looked up some polenta pizza recipes, just to see what various sources had to say. We watched a video of Mark Bittman making a breakfast polenta pizza on The Today Show. Then we kind of did our own thing. Sunday morning we made the polenta crust. 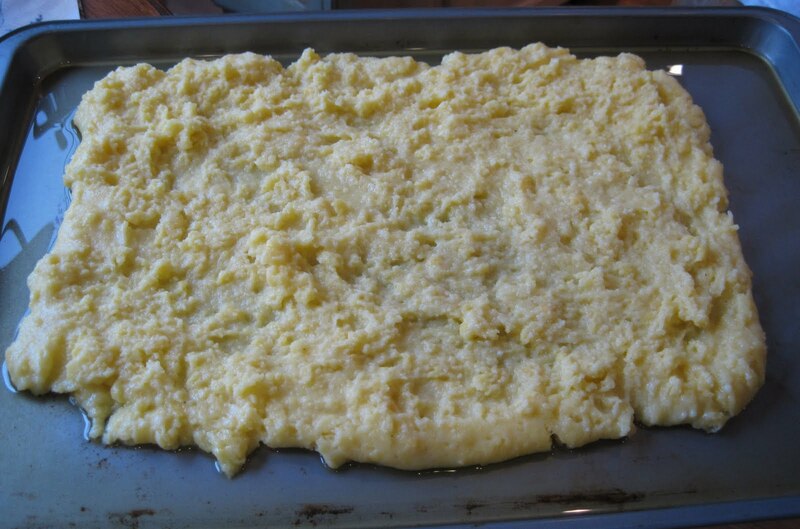 Polenta is easy to make. We ended up using 1/2 cup whole milk, 2.5 cups water, and 1 cup coarse cornmeal. I think several of our 'sources' used that ratio of ingredients (Brown Eyed Baker, Mark Bittman/NY Times). 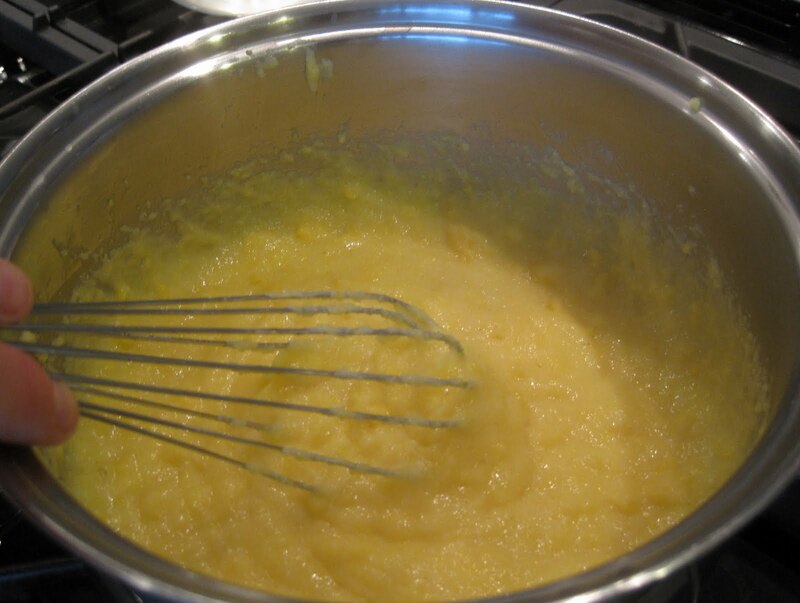 Bring the liquids to a boil, add cornmeal, and whisk until it's thick. We spread it out onto an oiled cookie sheet, covered it with plastic wrap, and stuck it in the refrigerator. Sunday evening, we heated the oven to 450 degrees and baked the polenta crust for 25-30 minutes. Meanwhile, we gathered our toppings: Spinach, sauteed mushrooms, jarred roasted red peppers, mozzarella cheese, sun-dried tomatoes, and capicola. 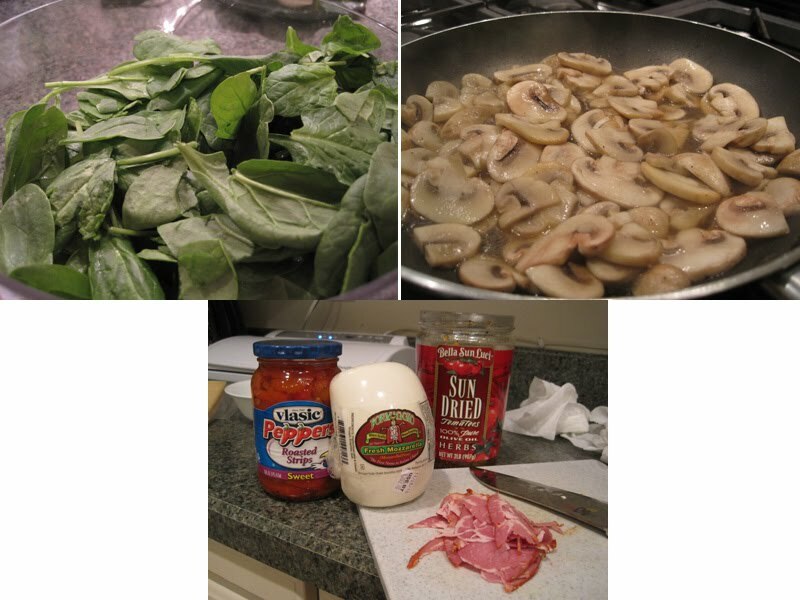 Here's a photo of the pizza topped with sauce, mushrooms, and spinach: We didn't saute the spinach since I don't really like sauteed spinach. We figured if we buried it under the cheese and some other toppings it would wilt just enough but not get crispy hard/burned. 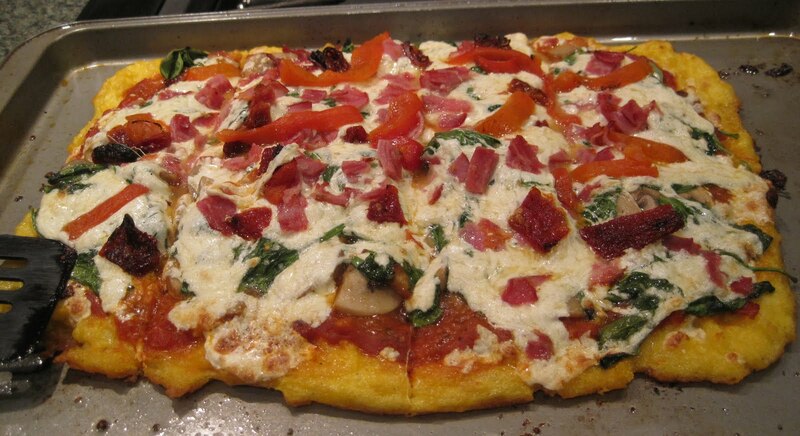 After we added the cheese, peppers, tomatoes, and capicola, we baked it until the cheese was melted and bubbly. 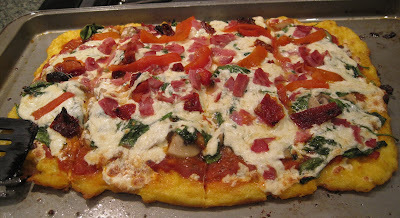 Here's our finished pizza: This was tasty, and with the extra spinach as a side salad, there were lots of veggies. I think I prefer a regular pizza crust, as does SP, but this was a very nice change. It also seems very filling since SP ate only 2 rectangles and I ate 1.5 (we cut it into 8 rectangles). Or maybe we were just still stuffed from brunch earlier in the day! That came out fantastic! I'm so glad you tried the recipe. 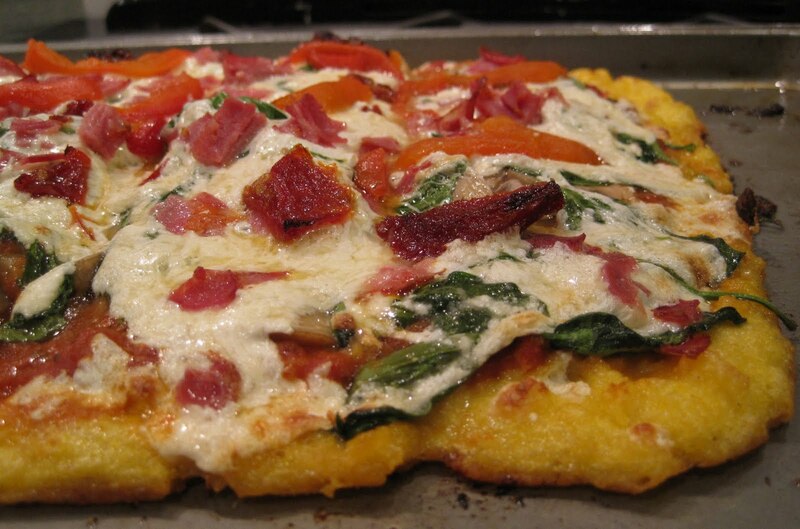 It's definitely not going to replace my favorite pizza crust anytime soon, but it gave me a newfound appreciation and obsession with polenta. And I have to say, capicola is one of the reasons why I have not given up meat entirely. Great choice.